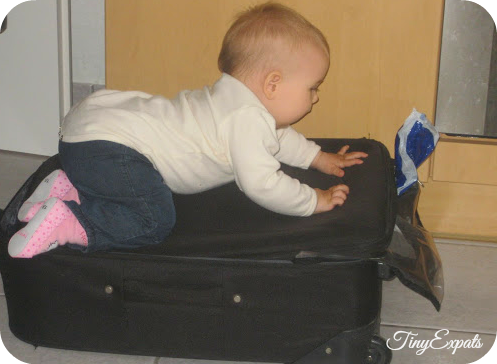 Today my husband went away on a business trip and this is our daughter helping him pack. I called the post Home Alone, although, of course, I’m not alone, but with my girls. It’s also not really a home but a place, which is very comfortable, but still not our own. It’s always harder, when your partner is away (at least, I think so), but dealing with this in a foreign country is taking it to another level. We already had to deal with waiting for daddy in Moscow – there he had to go to China every month for about 10 days. Let me remind you that it was in Moscow that I had our second child, so I was awaiting him at home with a toddler and a new born. Thank God, we had my mother-in-law to help us out, but, I’m sure you’d agree, it’s still not the same as having a husband around. These trips combined with a lot of overtime work were completely not working for us, so we pushed for a change and that is how my husband ended up with a new job and we ended up in Czech Republic. Here we’re all alone. No grandparents, no relatives. I’d like to believe that by now I’ve found a friend or two, who I at least can ask for help in an emergency. Still, every time before my husband goes away I check that I’m stocked up on groceries and medicine against fever/soar throat/running nose. Last time he went away, both of my girls got sick and I ran out of food at home. Those were a couple of days, when I urgently looked for a nanny. Thankfully, I managed to come across just a perfect one – with enough energy for both of my kids. She had a trial hour with them while I managed to run to a supermarket for some overdue food shopping. This time I’m more prepared. Food – check. Medicine – check. Nanny arranged during this period just to give me a couple of hours for myself – check. You can’t fully appreciate all the help you get from your partner until he’s not there. Although I’m at home with my kids, in the evenings I get some free time, but when he’s away – it’s babies 24/7. So a couple of breaks provided by a nanny – a must have for my sanity. Even with all the preparations staying home alone is still not easy: I realised that I’m coming down with a cold this morning, my little one has been teething for quite some time now and doesn’t plan on stopping and the older one decided that, if everybody else is moody, why shouldn’t she be as well? Today I was cooking while the baby went to the bedroom with a pencil, now we have a cave drawing, which I’m pretty sure won’t come off. I was cleaning the kitchen, while she spilled her soup all over the dining table, a chair and a large floor area (I thought the plate was too small to hold such an amount of liquid). I keep on finding bits of food and sweets all over the flat and the water puddles keep on forming all around (the baby thinks it’s funny how water spills from the cup on different surfaces). I accidentally ate a piece of play dough, which was disguised with bits of cookies on the table (that tasted horrible – I have no idea, why the baby’s trying to eat it at every opportunity). I was bathing them together at the same time (never works one by one) and the older one decided that I’m too dry. I was too tired to find words for what I felt about having my hair and top drenched in water. Now they fell asleep, but I’m pretty sure the teething will make itself known and I will have to sleep walk for another night. 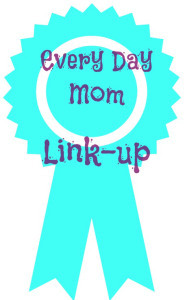 This post is takes part in Every Day Mum Link-up on From Diapers and Tutus to Meetings and Boardrooms! 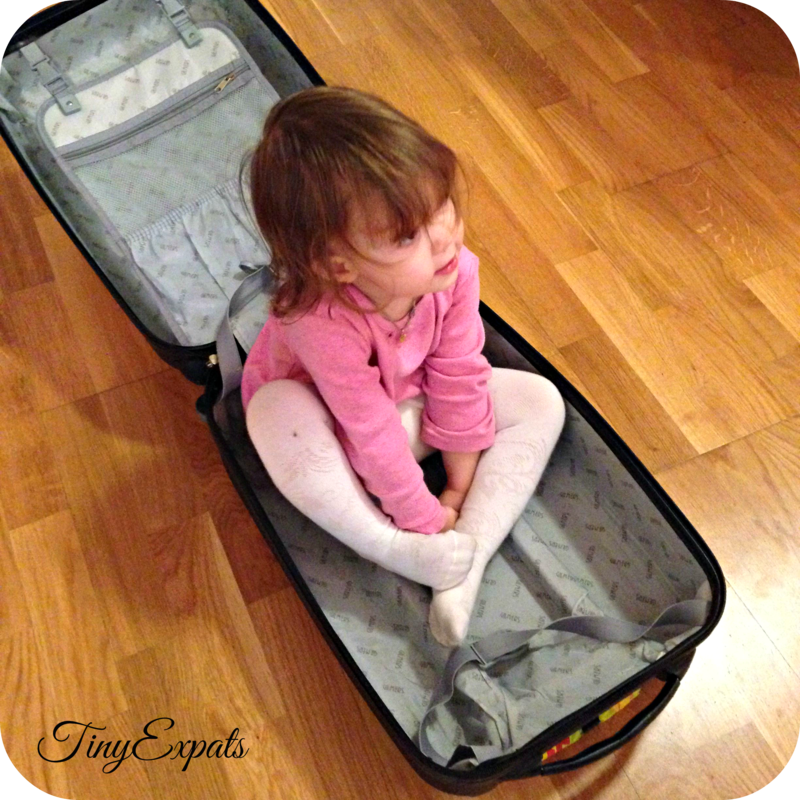 the photo of your daughter in the suitcase is priceless. Hi there, I loved reading this entry on home alone. You’ve brought a bit of nostalgia to me. You see before you know it your kidlets will be at school, then they get jobs, friends and you aren’t their whole world anymore. My kidlets are twenty and seventeen and are currently both at work. <3 I'm glad you found a nanny to give you some you time! Every mom needs me time! I kow exactly how you feel. Arriving in Pakistan we knew no-one. My husband was away one night and my baby was awake all night with what turned out to be a throat infection. I got hardly a jot of sleep. The next day I didn’t know how I was going to cope looking after the baby and my toddler. Luckily we had recently employed the most brilliant helper, Ansa, who swept in and took both children off to play whilst I caught up on a couple of hours kip. It was a difficult time though. At those times I wish we had grandparents around! Ha ha ha… perks of being part time single parent. I play this single parent role for about 6-7 months a year. And what about those lil’ demands like ” can we go to visit zoo?”, ” can we go to picnic?” etc and our answers being ” Let daddy come.. we’ll do this,,do that” and all that. the cave drawing u mentioned reminded me of my childhood story (which my mom keeps telling me) once she gave me some old lipsticks of hers so that i could use them for drawings n all…. next day she returns home and finds all her new lipsticks r gone too.. i used them for the silly drawings as well !!! oh my… funny and embarrassing at the same time !! I recently had the pleasure of taking care of all three of my boys alone….let me say that was FUN! Here the sarcasm in my typing? Being a single parent is hard! I give all those single parents major Kudos. It has to be extra hard being in a place and no support. Hang in there mama! Thank you! Nothing else left to do, but to deal with it :) Absolutely agree about single parents! I can relate to your situation a little bit. After my daughter was born my husband took a different job to allow me to stay at home with our daughter. I love staying at home, but he is away for 14-20 days at a time. My closes family is an hour away so I can’t really call on them at any time. My mom comes over and babysits once in a while so I can work one day a week (I worked hard for my nursing license and I don’t want to give it up!!) I do grocery shopping with my daughter every week. My husband wants to have another now (Bug is only 9 months old) but I told him we have to move closer to my family first. Thankfully this will eventually be an option for us once we get the money saved. Even though I only have one for now, I can feel your pain momma, I know it is tough, but hang in there, it is worth it to get to stay at home with your kiddos and see them grow up! Our kids have 3,5 years difference and I still felt like the older one is still too small. I completely understand why you’d like to wait :) Thanks for the support! There is indeed a light at the end of the tunnel, some days I kind of want to crawl right back into that tunnel, but my eyes are adjusting to this new light and it is beautiful here on the other side as well. The tunnel itself is not nearly as long as it appears to be, there are parts of my journey I wish I had let linger a little more, but looking back, it was a beautiful journey. Now I am travelling through the next phase of this parenting adventure, knowing there is yet another light at the end of this new tunnel, this time, my children are leading the way.